WUSA9 reports that the Prince George Police Department announced the arrest of five suspects connected to the notorious Mara Salvatrucha-13 (MS-13) street gang after the gruesome discovery of a slain 16-year-old boy stabbed more than 100 times and lit on fire in a Virginia field on March 9th. Police told local media that the victim, Jason Chicas, was also part of the "MS-13 clique" in question. Chicas was "killed inside of a home located in the 7000 block of Varnum Street in Landover Hills, Md. in Prince George's County. Police say his remains were then driven to Stafford County." His body was discovered after a Stafford County police officer noticed smoke and fire from the field where he was disposed and stumbled upon his body engulfed in flames. 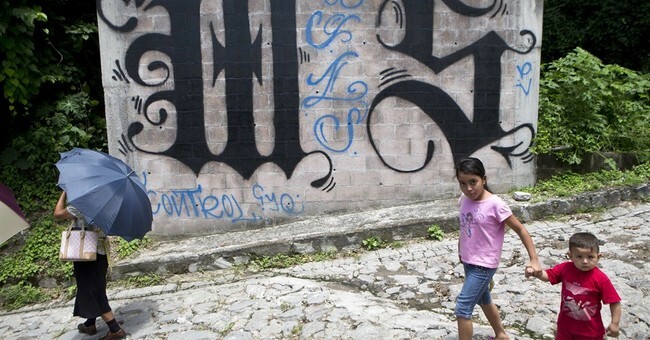 Investigators found that while the MS-13 clique was meeting that day with the alleged leader of the gang, Jose Ordonez-Zometa , an altercation ensued which escalated into senseless violence and death. “At that meeting, for reasons which are under investigation, there was a confrontation during which the 16-year-old was attacked and killed,” authorities told media. “This is a gang that turned on one of their own, so it’s obviously very, very violent,” Reily added. "10 stab wounds is obviously overkill." While MS-13 has gained national attention in recent years thanks to President Donald J. Trump's promise to "throw them the hell out of the country," the violent organization has been terrorizing the DC, Maryland, Virginia Area for more than two decades. In November 2000, the Washington Post reported that "MS-13 has been in Northern Virginia for at least five years, but the recent violence in Arlington and Fairfax counties has focused new attention on the problem." At the time, WaPO reported that "20 to 30 gangs in Northern Virginia have more than 2,000 members. Mara Salvatrucha has more than 600 members in Fairfax alone, and authorities say the number is growing. Police say they are keeping the problem in check, but some warn that the recent violence is a bad omen." According to WUSA9, the suspects arrested were "Jose Ordonez-Zometa, 29; Jonathan Castillo-Rivera, 20; Kevin Rodriguez-Flores, 18; Christian Martinez-Ramirez, 16; and Jose Hernandez-Garcia, 25. All have been charged as adults with first-degree murder."